Healthaid HEALTHAID OSTEOFLEX (GLUCOSAMINE CHONDROITIN) (PROLONGED RELEASE) Product #: SOM Price: Rs.1354.50 Rs.1354.50	Available from: SAVEONMEDICALS.COM In stock! Order now! Osteoflex formulation provides nutritional support for healthy joints and cartilage. A unique combination of high grade Glucosamine and Chondroitin Sulphate with added Vitamin C, Turmeric and Manganese to help maintain supple, flexible joints, strong cartilage and a healthy skeleton. Suitable for men and women of all ages. What is the frequency of use of HEALTHAID OSTEOFLEX (GLUCOSAMINE CHONDROITIN) (PROLONGED RELEASE)? Have you been prescribed HEALTHAID OSTEOFLEX (GLUCOSAMINE CHONDROITIN) (PROLONGED RELEASE) by a doctor? How do you rate HEALTHAID OSTEOFLEX (GLUCOSAMINE CHONDROITIN) (PROLONGED RELEASE) on price? Q1) Is HEALTHAID OSTEOFLEX (GLUCOSAMINE CHONDROITIN) (PROLONGED RELEASE) effective? Q2) What is the frequency of use of HEALTHAID OSTEOFLEX (GLUCOSAMINE CHONDROITIN) (PROLONGED RELEASE)? 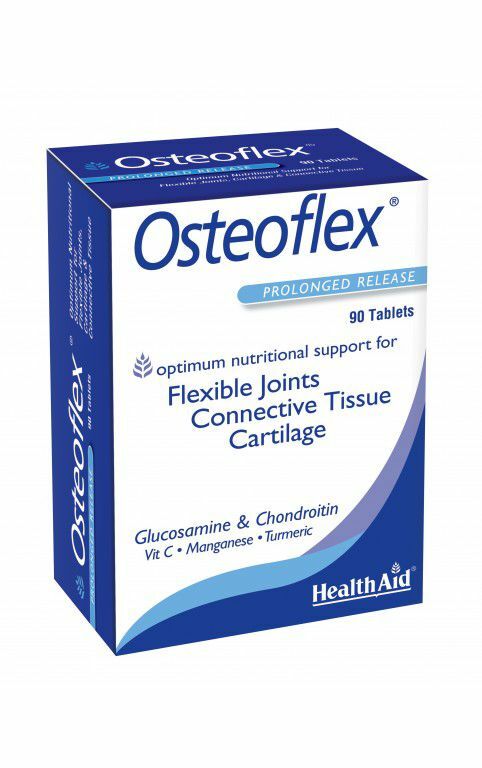 Q3) Have you been prescribed HEALTHAID OSTEOFLEX (GLUCOSAMINE CHONDROITIN) (PROLONGED RELEASE) by a doctor? Q4) How do you rate HEALTHAID OSTEOFLEX (GLUCOSAMINE CHONDROITIN) (PROLONGED RELEASE) on price? Q5) What is your overall rating of HEALTHAID OSTEOFLEX (GLUCOSAMINE CHONDROITIN) (PROLONGED RELEASE)? Is HEALTHAID OSTEOFLEX (GLUCOSAMINE CHONDROITIN) (PROLONGED RELEASE) effective?